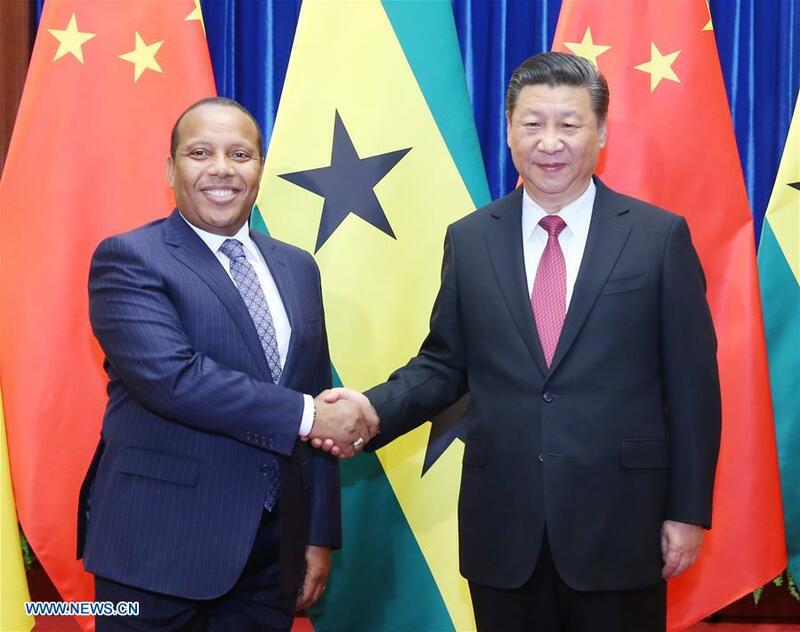 BEIJING, April 14 (Xinhua) -- Chinese President Xi Jinping on Friday met with Sao Tome and Principe Prime Minister Patrice Trovoada in Beijing, calling for mutual understanding and support on issues concerning each other's core interests and major concerns. Relations between China and Sao Tome and Principe have opened a new chapter, said Xi, saying that Sao Tome and Principe's return to the China-Africa family of friendly cooperation complies with the trend of the times. China highly appreciates the important contributions made by Prime Minister Trovoada in promoting the normalization of relations between China and Sao Tome and Principe, he said. Xi said China is willing to work with Sao Tome and Principe to jointly push forward mutually beneficial cooperation and the establishment of a comprehensive cooperative partnership featuring equality, mutual trust, and win-win cooperation. On pragmatic cooperation, Xi said China will support Sao Tome and Principe to improve its national comprehensive development plan, and boost mutually beneficial cooperation in tourism, fishery and agriculture. China will facilitate Sao Tome and Principe's efforts in realizing independent and sustainable development by supporting its infrastructure construction, human resources development and security capacity building, said Xi. He called on the two sides to enhance exchanges and cooperation in education, culture, health care, think-tanks, media, youth and women, so as to increase mutual understanding and friendship between the two peoples. China is ready to strengthen cooperation with Sao Tome and Principe on combating piracy and transnational organized crimes, he said. He also suggested the two sides enhance communication and coordination on the United Nations 2030 Agenda for Sustainable Development, climate change, peace and development in Africa, and other international and regional issues. On China-Africa relations, Xi said China supported a stronger Africa through unity and was willing to work with Africa to push forward the establishment of China-Africa community of shared future and interests. Trovoada said the resumption of diplomatic ties with China has received extensive support in Sao Tome and Principe. Sao Tome and Principe will firmly adhere to the one-China policy, he said. He highly appreciated China's African policy of sincerity, real results, affinity and good faith, and is ready to strengthen high-level visits with China following the spirit of mutual respect and trust. Sao Tome and Principe is willing to enhance cooperation with China in the areas of economy and trade, infrastructure, tourism and security, and deepen mutual support in international affairs, he said. His country will also work to deepen the traditional friendship between Africa and China, said Trovoada.